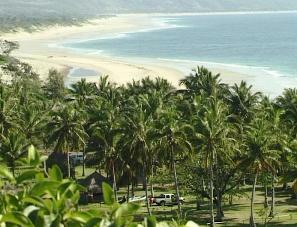 Morrungulo is situated 560 km north of Maputo close to the town of Masinga. On arrival one is welcomed by the unforgettable view of bright green coconut trees against a back drop of deep blue sea. Morrungulo is considered by many(as the most picturesque area on the mainland south of the Bazaruto islands. The stunningly beautiful beach with excellent fishing and diving stretches for about 60 km leaving plenty of space for everyone. This magnificent resort is set in an unspoiled natural bay amongst thousands of palm trees. Morrungulo is a fisherman's haven. Whether you enjoy surf fishing, or are rigged to catch Marlin or other game fish that are plentiful in the area, Morrungulo won't let you go home empty-handed. Boat launching is made easy and smooth due to the calm waters on this part of the coastline. Accommodation consist of 2, 4 and 8 bed self-catering bungalows and chalets that are constructed of a beautiful blend of kiaat, reed, razor grass, thatch and other local materials. The bungalows are sea facing, each with a fully equipped kitchen, its own patio, and en-suite bathroom with hot and cold water. The resort also offers self-catering casitas that are 2 story-thatched huts complete with 2 bedrooms, bathroom and open kitchen with lounge and dining area. 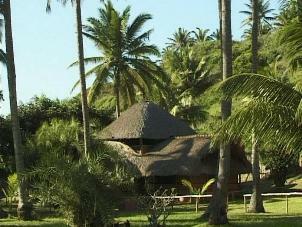 Morrungulo's large campsite is situated 20 meters from the beach amongst shady palm trees. Baraca's with plug points can by hired. These are thatched shelters ideal for groups as they can be turned into a kitchen or living area. Neat ablutions with flush toilets round off this 5 star campsite where you will enjoy an unforgettable holiday experience. A beautiful cozy bar is set amongst the palm trees between the campsite and bungalows. This is the ideal place to enjoy sundowners after a long day on the sea,and socialize with friends and family.